AppsFlyer's retargeting attribution for Twitter enables advertisers to attribute an additional engagement of a user with an ad on Twitter, and measure the quality of the user, post engagement, using the AppsFlyer reports. Ensure Retargeting is enabled for the app on the App Settings page. For details, click here. Once Twitter Retargeting Attribution is enabled on your AppsFlyer account, you can view your retargeting campaigns in the dashboard by clicking Retargeting on the side tool bar. All available information in the dashboard now displays the retargeting campaigns and the downstream in-app events reported after the engagement with the retargeting campaign. Re-engagement - an engagement with a retargeting campaign by a user who already has the app installed at the time of engagement. 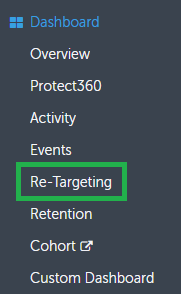 Re-attribution - an engagement with a retargeting campaign by a user who previously installed the app and then uninstalled it. Currently re-attributions tracking is not supported for Twitter generated traffic. The click lookback window for re-engagement on Twitter is hardcoded to 14 days. The view-through lookback window for re-engagement on Twitter is hardcoded to 1 day.